WESTERN Cape Community Safety MEC Dan Plato has questioned why the SANDF is being deployed to high-crime communities only after a predominantly black neighbourhood was attacked. 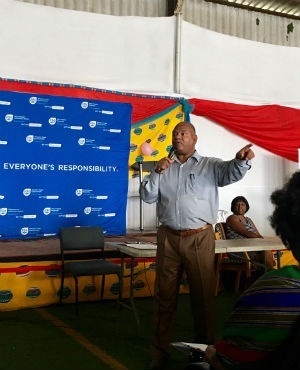 Speaking during a provincial after-school awareness session in Philippi East, Plato said Police Minister Fikile Mbalula had ignored the wave of crime on the Cape Flats while it was taking place in coloured communities. "If I must say, when the coloured community or other communities were hit in the same manner, he did nothing ... and now it is the township communities. What I must read into that, I do not know," he said. On Tuesday Mbalula asked that the SANDF be deployed to parts of Cape Town after 11 people were killed in a shooting in Marikana informal settlement, Philippi East, at the end of September. In a statement, Mbalula said "urgent additional steps must be taken" to manage the current scourge of crime. "Stabilisation and combating of these criminal activities are within the mandate of the SAPS, but due to the large groupings and military training of some of the perpetrators, the SANDF is requested to assist," he said. Plato said the exact details surrounding the military deployment in the city would be discussed at a provincial cabinet meeting next Wednesday. "The question remains" What is it the army will do? (Mbalula) needs to spell it out. What is it they are going to do when the gangsters begin to shoot at them?" Plato welcomed the appointment of Colonel Bongani Mtakati as the new station commander of Philippi East Police Station. "Many of the problems at many police stations are managerial. It's a leadership problem and I just hope he will bring the necessary change." Mbalula appointed Mtakati after he visited Marikana in the wake of the deadly shootings. The former commander, Colonel Vuyisile Payi, was not suspected of wrongdoing, but a drastic change was needed to restore trust, Mbalula said.